Not to blaspheme one of the Internet’s favorite pastimes or anything but, oh, sometimes we grow so weary of Justin Bieber. As people who write things that go on the Internet for a living, we have a working knowledge of what side our bread is Biebered on, but sometimes we get so. damn. tired. 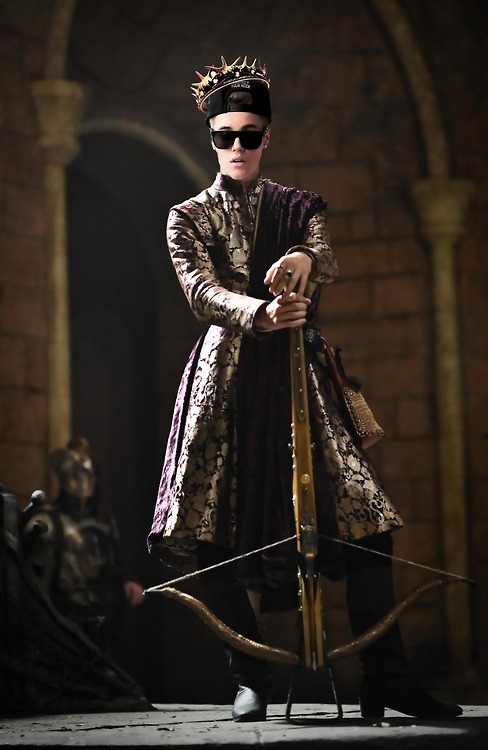 Joffrey Bieber. This is self-explanatory. Not to blaspheme one of the Internet’s favorite pastimes or anything but, oh, sometimes we grow so weary of Justin Bieber. As people who write things that go on the Internet for a living, we have a working knowledge of what side our bread is Biebered on, but sometimes we get so. damn. tired. Of reading about Justin Bieber. And writing about Justin Bieber. And wondering why Justin Bieber has not gone the way of other bratty, pouty pop wunderkind and just disappeared already. And listening to his latest single that [insert major rapper] has currently collabo-ed on. And remembering that’s why his pretty mug is still at the front of our collective Internet consciousness. And hating that we're now jamming to that single while we're typing up posts like this. Which leads us to another “Justin Bieber” Google search. Which makes us bone-weary all over again when said search yields “breaking news” stories like this. And this. And we wonder how we can even go on. But then, every so often, we stumble upon this. The Joffrey Bieber Tumblr. Which, while not breaking any new ground in artistic genius or anything, is...okay it’s dumb. It's pictures of the douchey boy king from Game of Thrones with the douchey boy pop star's head cropped in. What? You didn’t think of it. And so, because it’s Sunday — 'Game of Thrones' night! — and also because it’s Sunday — spiraling into deep pits of misery because the weekend is over and Monday anxiety is creeping in hard-night! — we’ll lift our self-imposed Bieber moratorium so that you can look at a picture of him leaning on a crossbow. Isn’t the Internet a strange and stupid place?